After having the script on hand for more than ten years, the Menomonie Theater Guild is excited to present the heartwarming story of “Little Women” at the historic Mabel Tainter Theater. Based off the timeless and enduring classic by Louisa May Alcott, the production is about the March sisters’ journey from childhood to maturity during the American Civil War. The script is written by Roger Wheeler and produced by special arrangement with Baker’s Plays. The play is being directed by Katie Shay. “I’ve done everything from comedy to drama to Shakespeare,” said Shay. This is the fourth production she has directed for the Menomonie Theater Guild. She directed two Shakespeare in the Parks including “Romeo and Juliet” and “As You Like It.” The last production she directed was “A Christmas Story” in 2013. Shay’s involvement in the Menomonie Theater Guild started out as a hobby but grew into a love for theater and a passion for working in the non-profit sector. Shay studied technical communications at University of Wisconsin–Stout. She currently works at the Mabel Tainter Center for Arts as a Patron Services Coordinator and the Menomonie Public Library as a Circulation Clerk. Shay, who knows the story of “Little Women” well, has always hoped to direct the play. 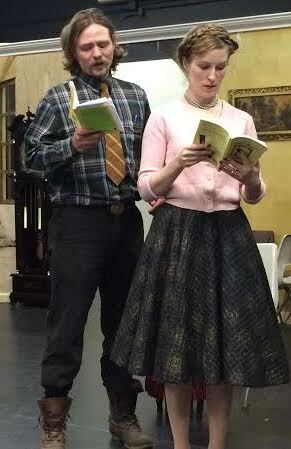 The Menomonie Theater Guild has had the “Little Women” script for more than a decade but had never done it before. “It is something I thought would be really great at the Mabel Tainter and for this community,” said Shay. Since the Mabel Tainter is celebrating its 125th year, the Victorian details and historic legacy serve as an appropriate setting for the production, as the novel was published in 1868. “We are using a lot of the furniture for our set and the play is almost the same era,” said Shay. The cast hopes audiences of all generations will enjoy the coming-of-age stories of the March family as they experience good and bad times and as they share the joys and pains of growing up. The production will be on May 8, 9, 15 and 16 at 7:30 p.m. and May 10 and 17 at 2 p.m. at The Mabel Tainter Center for the Arts, 205 Main Street East. Tickets are $15 for adults and $12 for seniors and students and are available at the Menomonie Theater Guild Studio Box Office, 502 W 2nd Street, and online at www.menomonietheaterguild.com.